The well known resort offers guest accommodation, a tranquil day spa- Bersantai, beautiful restaurant – Castaways Restaurant & Bar, and loads of adventure activities. 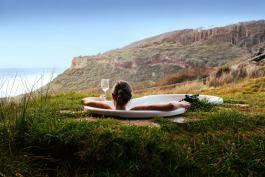 It’s one of the most popular wedding and conference destinations in the Greater Auckland region. Castaways have also embraced Glam Camping. 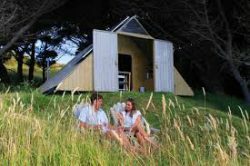 And with three Coastal Tents located on the secluded cliffs above Karioitahi Beach, as well as a tree tent suspended in between two mighty totara trees – they’ve not done it by halves. The Coastal Tents are located 10 minutes by golf cart from the main resort, giving couples a chance to instantly unwind in a truly restful and romantic spot. The Tree Tent is located in-land from the resort, surrounded by pristine bush. Whatever glam camping option you choose, central heating makes this the perfect city escape year round. With your gourmet self-cook dinner and breakfast included in the package, all you need to think about is getting yourself there – the rest is taken care of. All these specially designed tents are the ultimate in 5 star glamping. Although completely off-grid, solar power produces electricity for lighting, stereo, even an espresso machine and refrigerator – which you’ll find stocked full with all the food you’ll need to create delicious, gourmet meals on the BBQ. So, either spend your evenings soaking in the sunken outdoor bath, watching the sun set over the ocean, or surround yourself with native bush in the one-of-a-kind Tree Tent. 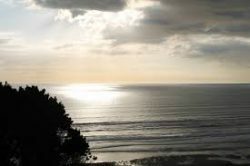 Go for a leisurely stroll on the stunning West Coast beach… Or wile away the hours watching the changing light through the trees.